Arriving in Buenos Aires in 1913, with only a suitcase and her father’s cherished violin to her name, seventeen-year-old Leda is shocked to find that the husband she has travelled across an ocean to reach is dead. Unable to return home, alone, and on the brink of destitution, she finds herself seduced by the tango, the dance that underscores every aspect of life in her new city. Knowing that she can never play in public as a woman, Leda disguises herself as a young man to join a troupe of musicians. In the illicit, scandalous world of brothels and cabarets, the line between Leda and her disguise begins to blur, and forbidden longings that she has long kept suppressed are realized for the first time. 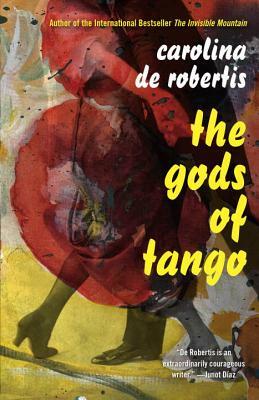 Powerfully sensual, The Gods of Tango is an erotically charged story of music, passion, and the quest for an authentic life against the odds. Carolina De Robertis, a writer of Uruguayan origins, is the author of two previous novels, Perla and The Invisible Mountain (a Best Book of 2009 according to the San Francisco Chronicle; O, The Oprah Magazine; and Booklist), and the recipient of Italy’s Rhegium Julii Prize and a 2012 fellowship from the National Endowment for the Arts. Her writings and literary translations have appeared in Zoetrope: All-Story, Granta, The Virginia Quarterly Review, the anthology Immigrant Voices, and elsewhere. Her novels have been translated into seventeen languages. She lives in Oakland, California.